The weather has quickly turned a corner here at Tumbleweed Farm and we are loving the cooler days. In fact, not only has it become chilly but we’ve gotten rain twice this week! If you ever want to see a couple of farmers cry with pure joy just visit a farm after a drought and watch them dance around in the pouring rain with arms wide open. We loved every second of getting soaked! Obviously the cooler weather means it’s time to start whipping up heartier meals. We’re still harvesting a ton of summer produce so I won’t be posting any fall meals for a while. With that being said, I still wanted to share a warming summer chili with you all to celebrate the first “true” rain of the season. This chili was the recipe of the week for our CSA members and I know they’ll love cooking this up with all of their Tumbleweed produce. This recipe calls for a bottle of beer and if you live near Migration Brewing (in Portland) definitely fill up a growler of pale ale and use some in this recipe. Obviously, you can use any pale ale but the folks at Migration are the absolute best and have treated us very well this season. Migration Brewing is where we drop off our CSA shares and the kind folks there reserve a special part of the bar for us and our members to sit and enjoy beer together every week. They totally rule! Anyhow, we hope you all enjoy this chili as much as we do. Cheers to the rain! 1 (12oz) bottle pale ale preferably from Migration Brewing! So glad for you guys that the rain has come. Here’s to the beautiful period between summer and fall. Man, I think of chili season as months away still, but it’s actually starting here in Switzerland too as it just turned cool and rainy. 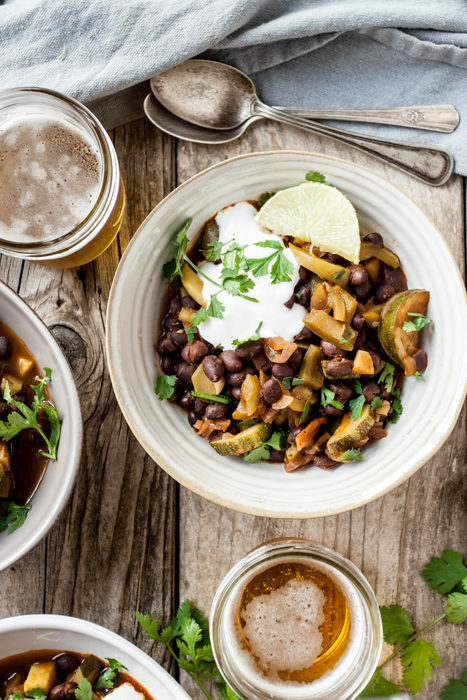 Love both the zucchini and beer in your chili! Your spicy black bean and sweet potato stew is a staple in our house (leftovers in the fridge right now!) and so I just know this will be a great alternative! Nice. Will have to try this. You don’t mention when to put in the beans. I assume it’s after deglazing the pan. Also, no tomatoes?